Nature is coming to life: that life which I so love, now and always, whose essence shall pervade everything which I compose. My symphonies have been like Jacob wrestling with the angel. But now they are as they should be. When I had completed En Saga, I took it straight to the binder. On Christmas Eve I collected it and the ink had stained the facing pages so badly that the score was completely ruined. I started to rewrite it immediately, which astonished my mother-in-law, as it was Christmas. With Kullervo I started a new style. This style has now been used by many younger composers. At its time of its birth Kullervo was a treasure house, but it has long since been emptied. I would like us Finns to have a little more pride. Not to be hanging our heads! What is there to be ashamed of? This is an idea that runs through Lemminkäinen's Return. Lemminkäinen can hold his own with any count or marquis. He is an aristocrat, definitely an aristocrat. My second symphony is a confession of the soul. I was writing the fourth symphony in the Fennia Hotel. 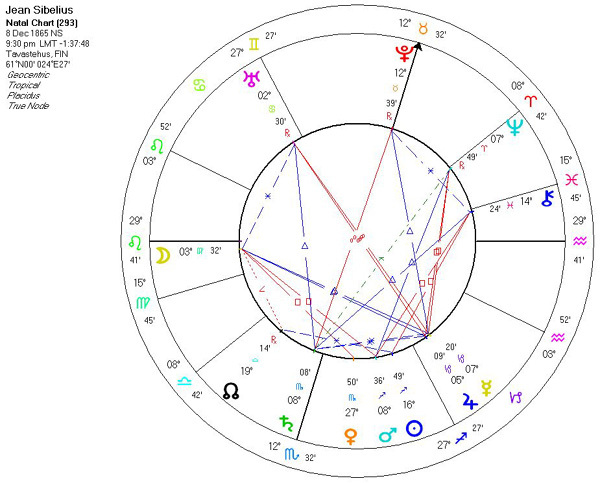 Kajanus dropped in and asked why I was stressing myself so much. But I am pleased that I did it, for even today I cannot find a single note in it that I could remove, nor can I find anything to add. This gives me strength and satisfaction. The fourth symphony represents a very important and great part of me. Yes, I'm glad to have have written it. The sixth symphony always makes me remember the scent of the first snow. Remember that all my rough sketches must be burned after my death. I don't want anybody writing 'Sibelius letzten Gedanke' [Sibelius's last thoughts] or something like that. My life is about to end, and I should like to complete one work. If I die before that everything has been in vain. The framework of a symphony must be so strong that it forces you to follow it regardless of the environment and circumstances: [it is] an "ethical necessity". The symphony must always be internally compelling and inevitable. Some misprints remain on my scores, because for some reason I have always been in a rush to get the proofs to the publisher by the deadline. In the orchestral parts everything has usually been corrected. The present time has to a great extent liberated itself from symphonic form – from formalism. This started when the concert halls became empty, because that form has nothing to do with human beings. I believe that the present time is progressing. You have to have a personal relationship with a cigar. It gets annoyed with a bad smoker and it won't burn. If you talk a lot while you smoke, the cigar punishes you and stops burning and you have to light it again. It must be treated with respect and elegance. All the doctors who ordered me not to smoke or drink spirits are long since dead. But I go on living. About 100,000 years ago I must certainly have been related to swans and wild geese, because I feel so drawn towards them. If I had become a conductor, I would have worn myself out in a couple of years. My temperament is like that. My letters would give an entirely false picture of me. They always take on the tone that is best suited to the recipient. This is a strange diary. The mirror of a sensitive soul or – if you wish – a spittoon. I will definitely never become the great composer that I and Aino dreamt I would be. It is strange that something has become of me, because I have done so much in my life quite the opposite of what should have been done. It is wonderful to be appreciated during one's own lifetime. There are so many who never discover that their art has won its place. I'm truly grateful to the British and the apostles of the Queen's Hall that the tributes to me reached me during my lifetime. I read in the paper that I cannot accept the invitation to the Edinburgh Music Festival because of my advanced age. This is the first time this has been said of me, and it is certainly more pleasant than saying, for instance, that I am sick, in which case everybody would pity me. I was always the youngest and I got used to being young. Even today, at almost 83 years old, it feels strange to read about "my advanced age". I am never alone. I have my fantasies. I, who owe you so much, can say that without you my life would have come to a standstill long ago and my achievements would be poorer and smaller. It is no trifling matter to be the wife of a composer like me. The happy intervals, when the work is ready, are scarce, and the struggle in the dark of the night is long. The fact that you have endured these storms of our life is truly wonderful. When I now express my heartfelt thanks to you, I have this gnawing feeling that I have so far done much less than what an artist in my position ought to do. I hope that it will still be possible for me to express my gratitude in deeds. Lastly, I express the congratulations of my brother and sister and I ask you to remember how fond my mother was of you." My life is definitely finished. If just once I'm in a merry mood and take a glass, I have to suffer for it for a long time afterwards This terrible depression – which Aino cannot understand and which I have inherited from my ancestors. Because I'm so thin-skinned or lacking in confidence Aino and the children will never receive proper support in life. Life is rich and deep. I have to give up conducting, for I've reached a point when I have to make special efforts to calm my nerves, something that my doctor, too, has been well aware of. I now have everything in order financially, and I can concentrate on what I want to concentrate on. Isn't it wonderful. My alcohol consumption is very moderate. In the evening, working on the symphony. This important task which strangely enchants me. As if God the Father had thrown down pieces of a mosaic from the floor of heaven and asked me to work out the pattern. Perhaps a good definition of "composing". Perhaps not. How should I know!" If I had stayed in Järvenpää until the night before the arrival of the Germans, I would have been murdered, says the local telephone lady. My old dream of sitting as a 'father of the family' at the head of a large table with many children around me is – as far as children are concerned – about to come true. Johan Julius Christian "Jean"/"Janne" Sibelius (pronunciation (help·info); December 8, 1865 – September 20, 1957) was a Finnish composer of classical music and one of the most notable composers of the late 19th and early 20th centuries. His music played an important role in the formation of the Finnish national identity. Sibelius was born into a Swedish-speaking family in Hämeenlinna in the Russian Grand Duchy of Finland. Although known as "Janne" to his family, during his student years he began using the French form of his name, "Jean", inspired by the business card of his seafaring uncle. The core of Sibelius's oeuvre is his set of seven symphonies. Like Beethoven, Sibelius used each one both to develop a single musical idea and to further develop his own personal compositional style. These works continue to be performed frequently in the concert hall and are often recorded. In addition to the Symphonies, Sibelius's best-known compositions include Finlandia, Valse Triste, the Violin Concerto, the Karelia Suite and The Swan of Tuonela (one of the four movements of the Lemminkäinen Suite). Other works include pieces inspired by the Kalevala, over 100 songs for voice and piano, incidental music for 13 plays, the opera Jungfrun i tornet (The Maiden in the Tower), chamber music, piano music, 21 separate publications of choral music, and Masonic ritual music. 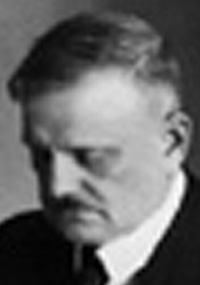 Sibelius composed prolifically until the mid-1920s. However, soon after completing his seventh symphony (1924) and the tone poem Tapiola (1926), he went into a 30-year period of near artistic silence, which lasted until his death in 1957. After Sibelius graduated from high school in 1885, he began to study law at Aleksander's Imperial University in Helsinki. However, music interested more than law and he soon quit his studies. From 1885 to 1889, Sibelius studied music in the Helsinki music school (now the Sibelius Academy). One of his teachers there was Martin Wegelius. 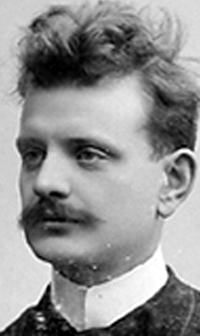 Sibelius continued studying in Berlin (from 1889 to 1890) and in Vienna (from 1890 to 1891). Jean Sibelius married Aino Järnefelt (1871–1969) at Maxmo on June 10, 1892. Their home, called Ainola, was completed at Lake Tuusula, Järvenpää in 1903, and the two lived out the remainder of their lives there. They had six daughters: Eva, Ruth, Kirsti (who died at a very young age), Katarine, Margaret, and Heidi. He has a great-great-great-great-great-grandniece named Kristine Sibelius. His 90th birthday, in 1955, was widely celebated and both the Philadelphia Orchestra under Eugene Ormandy and the Royal Philharmonic Orchestra under Sir Thomas Beecham gave special performances of his music. The orchestras and their conductors also met the composer at his home; a series of memorable photographs were taken to commemorate the occasions. Both Columbia Records and EMI released some of the pictures with albums of Sibelius' music. Beecham was honored by the Finnish government for his efforts to promote Sibelius both in the U.K. and the United States. [He] was returning from his customary morning walk. Exhilarated, he told his wife Aino that he had seen a flock of cranes approaching. "There they come, the birds of my youth," he exclaimed. Suddenly, one of the birds broke away from the formation and circled once above Ainola. It then rejoined the flock to continue its journey. Two days afterwards Sibelius died of a brain haemorrhage. He died at age 91 on September 20, 1957 in Ainola, where he is buried in a garden. Aino lived there for the next twelve years until she died on June 8, 1969; she is buried with her husband. Like many of his contemporaries, Sibelius was initially enamored with the music of Wagner. A performance of Parsifal at the Bayreuth Festival had a strong effect on him, inspiring him to write to his wife shortly thereafter, "Nothing in the world has made such an impression on me, it moves the very strings of my heart." He studied the scores of Wagner's operas Tannhäuser, Lohengrin, and Die Walküre intently. With this music in mind, Sibelius began work on an opera of his own, entitled Veneen luominen (The Building of the Boat). However, his appreciation for Wagner waned and Sibelius ultimately rejected Wagner's Leitmotif compositional technique, considering it to be too deliberate and calculated. Departing from opera, he later used the musical material from the incomplete Veneen luominen in his Lemminkäinen Suite (1893). More lasting influences included Ferruccio Busoni, Anton Bruckner and Tchaikovsky. Hints of Tchaikovsky's music are particularly evident in works such as Sibelius' First Symphony (1899) and his Violin Concerto (1905). The influence of Bruckner is most strongly felt in the 'unmixed' timbral palette and sombre brass chorales of Sibelius's orchestration, as well as in the latter composer's fondness for pedal points and in the underlying slow pace of his music. Sibelius progressively stripped away formal markers of sonata form in his work and, instead of contrasting multiple themes, he focused on the idea of continuously evolving cells and fragments culminating in a grand statement. His later works are remarkable for their sense of unbroken development, progressing by means of thematic permutations and derivations. The completeness and organic feel of this synthesis has prompted some to suggest that Sibelius began his works with their finished statement and worked backwards. 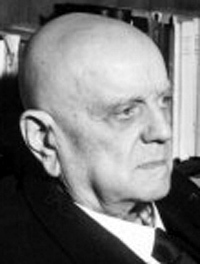 Sibelius has often been criticized as a reactionary figure in 20th century classical music. Despite the innovations of the Second Viennese School, he continued to write in a strictly tonal idiom. 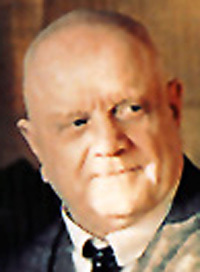 However, critics who have sought to re-evaluate Sibelius' music have cited its self-contained internal structure, which distills everything down to a few motivic ideas and then permits the music to grow organically, as evidence of a previously under-appreciated radical bent to his work. The severe nature of Sibelius' orchestration is often noted as representing a "Finnish" character, stripping away the superfluous from music. Portrait of Sibelius from 1894 by Akseli Gallen-KallelaThis self-contained structure stood in stark contrast to the symphonic style of Gustav Mahler, Sibelius' primary rival in symphonic composition. While thematic variation played a major role in the works of both composers, Mahler's style made use of disjunct, abruptly changing and contrasting themes, while Sibelius sought to slowly transform thematic elements. The Finnish composer wrote that he "admired [the symphony's] severity of style and the profound logic that created an inner connection between all the motifs...Mahler's opinion was just the reverse. 'No, a symphony must be a world. It must embrace everything.'" However, the two rivals did find common ground in their music. Like Mahler, Sibelius made frequent use both of folk music and of literature in the composition of his works. The Second Symphony's slow movement was sketched from the motive of the Commandatore in Don Giovanni, while the stark Fourth symphony combined work for a planned "Mountain" symphony with a tone poem based on Edgar Allan Poe's "The Raven". 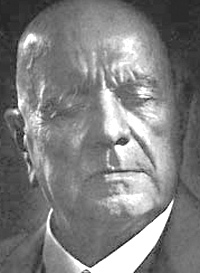 Sibelius also wrote several tone poems based on Finnish poetry, beginning with the early En Saga and culminating in the late Tapiola (1926), his last major composition. Sibelius's melodies often feature powerful modal implications. Sibelius studied Renaissance polyphony, as did his contemporary, the Danish composer Carl Nielsen, and Sibelius's music often reflects the influence of this early music. He often varied his movements in a piece by changing the note values of melodies, rather than the conventional change of tempi. He would often draw out one melody over a number of notes, while playing a different melody in shorter rhythm. For example, his Seventh symphony comprises four movements without pause, where every important theme is in C major or C minor; the variation comes from the time and rhythm. His harmonic language was often restrained, even iconoclastic, compared to many of his contemporaries who were already experimenting with musical Modernism. 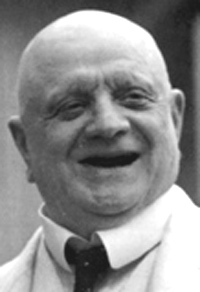 As reported in the Manchester Guardian newspaper in 1958, Sibelius summed up the style of his later works by saying that while many other composers were engaged in the manufacture of cocktails for the audience and public, he offered them pure cold water. Because of this conservatism, Sibelius's music is sometimes considered insufficiently complex, but he was immediately respected by even his more progressive peers. Later in life he was championed by critic Olin Downes, who wrote a biography, but he was attacked by composer-critic Virgil Thomson. Perhaps one reason Sibelius has attracted both the praise and the ire of critics is that in each of his seven symphonies he approached the basic problems of form, tonality, and architecture in unique, individual ways. On the one hand, his symphonic (and tonal) creativity was novel, but others thought that music should be taking a different route. 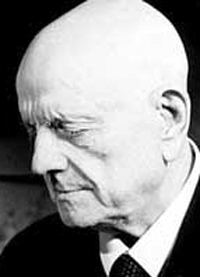 Sibelius's response to criticism was dismissive: "Pay no attention to what critics say. No statue has ever been put up to a critic." Over time, he sought to use new chord patterns, including naked tritones (for example in the Fourth Symphony), and bare melodic structures to build long movements of music, in a manner similar to Joseph Haydn's use of built-in dissonances. Sibelius would often alternate melodic sections with blaring brass chords that would swell and fade away, or he would underpin his music with repeating figures which push against the melody and counter-melody. There is substantial evidence that Sibelius worked on an eighth numbered symphony. He promised the premiere of this symphony to Serge Koussevitzky in 1931 and 1932, and a London performance in 1933 under Basil Cameron was even advertised to the public. However, the only concrete evidence for the symphony's existence on paper is a 1933 bill for a fair copy of the first movement . Sibelius had always been quite self-critical; he remarked to his close friends, "If I cannot write a better symphony than my Seventh, then it shall be my last." Since no manuscript survives, sources consider it likely that Sibelius destroyed all traces of the score, probably in 1945, during which year he certainly consigned (in his wife's presence) a great many papers to the flames. Sibelius has fallen in and out of fashion, but remains one of the most popular 20th century symphonists, with complete cycles of his symphonies continuing to be recorded. In his own time, however, he focused far more on the more profitable chamber music for home use, and occasionally on works for the stage. Eugene Ormandy and, to a lesser extent, his predecessor Leopold Stokowski, were instrumental in bringing Sibelius's music to the American audience by programming his works often, and the former thereby developed a friendly relationship with Sibelius throughout his life. Currently Paavo Berglund and Colin Davis are considered major exponents of his work. Other classic sets of recordings of the symphonies are by John Barbirolli, Vladimir Ashkenazy, Leonard Bernstein, Simon Rattle and Lorin Maazel. Herbert von Karajan was also associated with Sibelius, recording all of the symphonies except the Third, some several times. Recently Osmo Vänskä and the Lahti Symphony Orchestra released a critically acclaimed complete Sibelius cycle, including unpublished or retracted pieces such as the first versions of the Fifth Symphony (1915) and the Violin Concerto (1903). Johan (Jean) Julius Christian was born on December 8th, 1865 in Hämeenlinna, a small garrison town some hundred kilometres north of Helsinki. When the boy was only two, his father died, heavily indebted, and the family had no choice but to live with Sibelius's maternal grandmother. The five-year-old "Janne", as he was called as a child, sat by the piano, tickling out melodies and chords from it. At the age of ten, he played by heart parts from a concerto. From that time, c. 1875, comes his first composition: "Vesipisaroita" (Drops of Water) for violin and cello. In the spring of 1880, he started taking violin lessons, and thus the violin cast its spell on him. Janne's sister Linda played the piano, and their little brother Christian the cello, together amounting to a piano trio. At first, they played pieces from the Viennese classical and romantic repertoires, but soon chamber music composed by Janne. This picture shows the sibling-trio in the 1870s. Janne came from a Swedish-speaking family, but he went to a Finnish-speaking school. This way, he became familiar with the heritage and culture of the Finnish language. At school he was often in a world of his own. He finished school, taking the matriculation examination, in the spring of 1885. Jean Sibelius, the student of music. 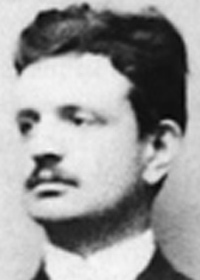 In the autumn of 1885, Sibelius moved to Helsinki, to study law at the University. At the same time, he enrolled in the Helsinki Music Institute, the present Sibelius Academy. Sibelius abandoned his legal studies, when music took up all his time - initially by the violin and then increasingly by composition. The oeuvre from this time at the music institute, culminated in Sibelius's first masterpiece, the String Quartet in A minor, performed for the first time on the 29th of May, 1889. During 1889-90 he continued his studies in Berlin, and 1890-91 in Vienna, where he made the first sketches of Kullervo. Before composing became his main aspiration, Sibelius dreamt of career as a violin virtuoso. His violin tutor at the music institute was Mitrofan Wasileff(center), surrounded here by his pupils, Sibelius on the far left. At the music institute, Sibelius became well acquainted with one of the teachers, the pianist and composer Ferruccio Busoni. The friendship lasted until Busoni's death in 1924. 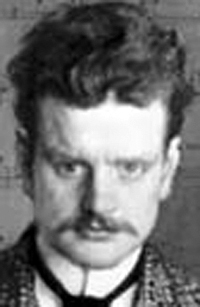 Sibelius in Berlin in 1889, where under the guidance of his teacher Albert Becker, he laboured with contrapuntal studies. "What a bore, not being allowed to do anything else". In the spring of 1892 Sibelius conducted his extensive five-movement Kullervo for soloists, choir, and orchestra in Helsinki. With it began his career as an orchestral composer. It was also the occasion for his debut as a conductor. The following year he finished the orchestral work En Saga, and in 1895 the Lemminkäinen suite. Sibelius led a frenzied life: he composed, taught, conducted, played chamber music - and made merry ! In the summer of 1892, Sibelius married the artistically inclined Aino Järnefelt. The central artistic figures in the Helsinki of the 1890's - Sibelius (right), conductor R.Kajanus who had his hand in making Sibelius's music known (centre), painter Axel Gallén (left) - and certain others, formed a so called Symposium-circle. This is where the delirium of life and imminence of death, was aroused to its highest intensity during the symbolistic 1890s. With the turn of the century, a new phase began in Sibelius's life. Thus far he had been a national composer, but now he started conducting his works aboard, foremost in Britain and Germany. Other conductors included his music in their repertoires as well, as far as the USA. The first two symphonies were completed in 1899 and 1902, and the Concerto for Violin was under way. The statue of Finland's national poet J.L.Runeberg on the Helsinki Esplanade in the late 1890s. Runeberg was one of the poets whose work Sibelius loved and set to music most. The building on the far left housed the famous restaurant Kämp, which Sibelius frequented both around this time and later on. Together with premiere performance of the Symphony no. 1 in the spring of 1899, Aténarnes sång (The War Song of the Tyrtaeus) was also performed for the first time. The song was Sibelius's patriotic comment against the harsh Russianization policy of the Czarist regime, and from this moment on Sibelius was to be identifield at the forefront of nationalist feeling. Caricatures are one of the signs of growing fame. Drawing from 1904. In 1904, Sibelius moved with his family to Villa Ainola, the house they had built in Järvenpää, some 40 km north of Helsinki. The change from the restless city life full of temptations, to the peace of the countryside, proved auspicious for Sibelius work, "In Helsinki, the song died within me". The Concerto for Violin was completed in 1904-05. After that he gradually moved away from the national romantic style, a change that can already be seen in Symphony no. 3 (1907). Villa Ainola in winter. There was no electricity, and the house was heated by log fires. Winter storms blew in and around the corners at night. Every spring, summer, and autumn Sibelius, to whom nature was like a sanctuary, watched the birds and listened to their song. Valse Triste is a piece of music for the theatre that was played all over Europe, and that has been arranged in numerous ways. It made Sibelius's name even better known than Finlandia (1900). The right kind of publishing contract would have made the forever indebted Sibelius a rich man, but he sold the rights of the piece for a petty sum. In the summer of 1908, Sibelius was operated on for a tumour in the throat, after which he refrained from alcohol for seven years. after the operation, the musical expression of many of his works became more introverted. This development can already be traced in the String Quartet in D minor ("Voces intimae", 1909), and it culminates in Symphony no. 4 (1911), taken to the utter realms of tonality. Axel Carpelan was friend and patron of Sibelius, from the turn of the century. He was also one of the first to speak for the "difficult" language of the Symphony no. 4. After Carpelan's death in 1919, Sibelius wrote in his diary: "For whom will I compose now?" In 1914, Sibelius travelled to the USA to conduct the first performance of The Oceanides. During the same visit, he received an honorary doctorate from Yale University. The picture shows the artist S. Wetterhovi-Aspa's vision of Sibelius in the Yale doctoral robe. Sibelius himself thought that his friend's painting was "all wrong". 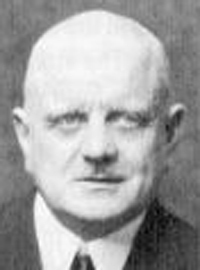 The start of the first world war in 1914 forced Sibelius into giving up foreign concert performances; moreover, Germany, where his main publisher was, had become the enemy. 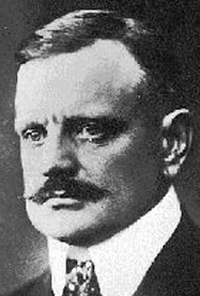 During the war, to relieve his financial troubles, Sibelius composed and sold several small pieces to Helsinki publishers. Most of the pieces, nonetheless, were not published until after the war. Symphony no. 5 was completed in 1915, and revised in 1916 and 1919. Sibelius's 50th birthday on December 8th, 1915, was the occasion for a great national celebration. At the anniversary concert Sibelius conducted, among other works the first version of Symphony no. 5. 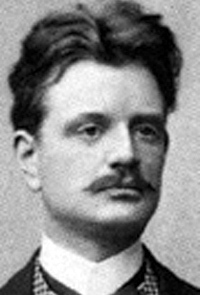 Sibelius had six daughters, one of whom died shortly after birth. Finland declared its independence on December 6th, 1917. In the spring of 1918, civil war broke out. Sibelius had to seek refuge in the war-famished Helsinki. The pictures shows German reinforcements of the Whites in Helsinki, a scene of some of the battles. After the war, life slowly returned back to normal; international connections were reopened, and Sibelius was again able to travel, to the Nordic countries, Britain, Italy ... Years 1923-24 saw the completion of Symphony nos. 6 and 7. Never ending financial troubles - made worse by inflation, and Sibelius's way of handling money, made it necessary for Sibelius to go on composing numerous little pieces, mainly for the piano. Sibelius was famous for his cigars and the deep folds on his brow. On top of that, even though he was amusing company and laughed a lot, he usually looks stern in photographs. The caricature "the Symphonies of Sibelius or the story of the cigar and the seven folds" alludes to the special nature of Symphony no. 4. In the autumn of 1926, Sibelius stopped conducting and around this time, his last major works were composed: music to Shakespeare's play, The Tempest (1925), which Sibelius turned into two orchestral suites (1927), and the tone poem Tapiola (1926). In addition, he started working on an Eighth Symphony. By now Sibelius was an internationally acknowledged composer, especially in the Anglo-Saxon world. With the foundation in 1928 of the Finnish composers' copyright bureau, even his economic situation began to improve. As in Kullervo, the inspiration for Tapiola draws upon the Finnish national epic, Kalevala. Tapio is a forest king, and it has been said of the composition that it is like a forest converted into music. For foreign listeners, Sibelius completed the score of Tapiola with a four line motto. At the end of the 1920s he still wrote some pieces for the piano, as well as for violin and piano. In the 1930s, the world waited for a Symphony no. 8 - in vain. From the early 30s, Sibelius retired into the so called "Silence of Järvenpää". Independent of him, his music went on conquering the world. In his home country, he had been permanently dubbed into one of the biggest national heroes. 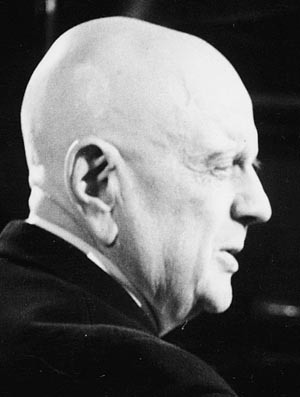 In 1935, on his 70th birthday, Sibelius appeared in public for the final time. 7000 listeners attended his birthday concert, among them three former president of the country and other notable personalities. Aino and Jean Sibelius are in the front now, on the right. Although Sibelius himself no longer participated in musical events, he followed curent affairs carefully by reading the papers, and listening to the radio in his armchair in the Ainola library. Sibelius continued composing his Symphony no. 8 well into the 1930s, most likely up until 1938. During the mid 40s he burnt the work. This sketch is all that is known of it. From 1938 Sibelius released new works again. He did not compose much more than a few minor pieces, but he made arrangements of earlier works. A few months prior to his death he arranged the song "Kom nu hit, död" (Come Away, Death!). Sibelius remained active until the very end, following world news in his Ainola. During the 1940s and 50s, many famous musicians came to Ainola to visit Sibelius. The pictures shows Sibelius accompanied by the American conductor Eugen Ormandy in 1951. Sibelius died at Ainola on the evening of september 20th 1957, at the same time as his Symphony no. 5 was being performed in the University of Helsinki hall. At his death, the country went into mourning. When the funeral procession proceeded from the church towards Ainola after the memorial service, thousands of mourners lined the roadside, and candles burnt at the windows. Sibelius was buried in his beloved Ainola. The central part of Sibelius' work consist of his symphonies and other orchestral works, but he composed piano, chamber, choral, and incidental music, as well as an opera. Sibelius became the symbol of Finnish music and of Finland. Above that, he reached a level of universality in his music, in particular through his symphonies, achieved by the greatest spirits in western music have.